San Ramon is the second largest town in the Chanchamayo Province of the Junin Region, on the eastern slopes of the Andean Cordillera oriental in Peru. San Ramon is situated at an elevation of 770 m above sea level. It lies at the confluence of Rio Oxabamba and Rio Tulumayo which form Rio Chanchamayo downstream and Rio Perene later. West of the city we find the Toro Huajrashga Mountain. The nearest town downstream is La Merced, the province's capital, at a distance of less than 10 km. 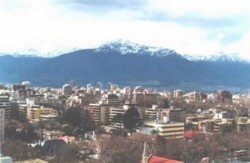 The city has a population of circa 7,500 inhabitants.